This is the fourth article in the series detailing some of the many highlights of the Costa Brava in Catalonia. In case you missed them, you can read about Blanes here, all about Tossa de Mar in this article, about the Lloret de Mar restaurant Sant Pere del Bosc here and the one about Palamos here. After an extremely relaxing extended lunch in Cala S’Alguer it was time to leave Palamos for our next destination. There are plenty of good reasons to visit Begur, which is located twenty minutes’ drive north of Palamos. For my time in Begur I was a guest of the Costa Brava Tourist Board, but as always, my opinions are my own. If you are looking for the best value airfare to Spain – and many other destinations – we have a Vueling Airline Discount code right here! Begur looks beautiful, for a start. Set on a hill with the ruins of a 10th century castle looming above it, the village has a number of cafes, bars and restaurants among its narrow streets in which to relax. Then there are the nearby beaches – four are within easy distance and all are stunning. In summertime a beach bus service runs and is highly recommended – it will take you an hour to walk the winding roads in the hot sun. You can drive yourself but if you do, set off early to ensure you find a parking space. Hollywood was impressed by Begur, too – Elizabeth Taylor starred in “Suddenly Last Summer” that was filmed here in 1959. So all in all, you’d be wise to add Begur to your itinerary. And if you visit in September, here’s yet another reason – the Indians Fair. 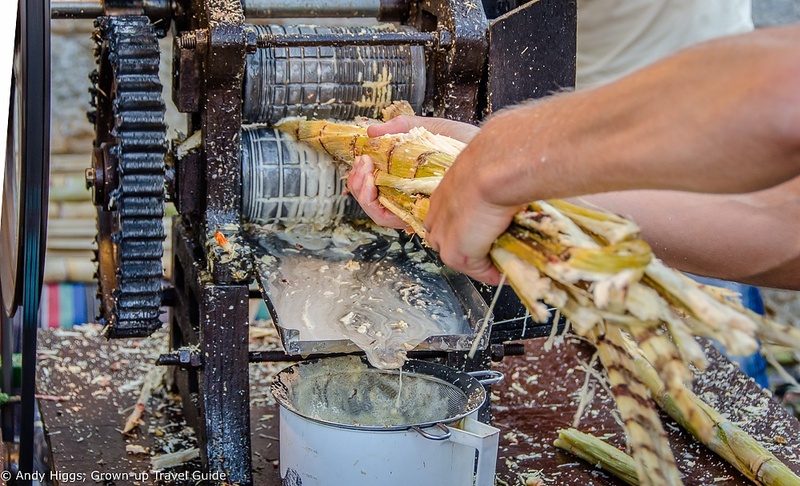 For three days every year in the first week of September, Begur comes alive with a carnival atmosphere. Cuban flags hand from buildings, salsa music echoes around the town centre as hundreds of visitors dance to the rhythm. 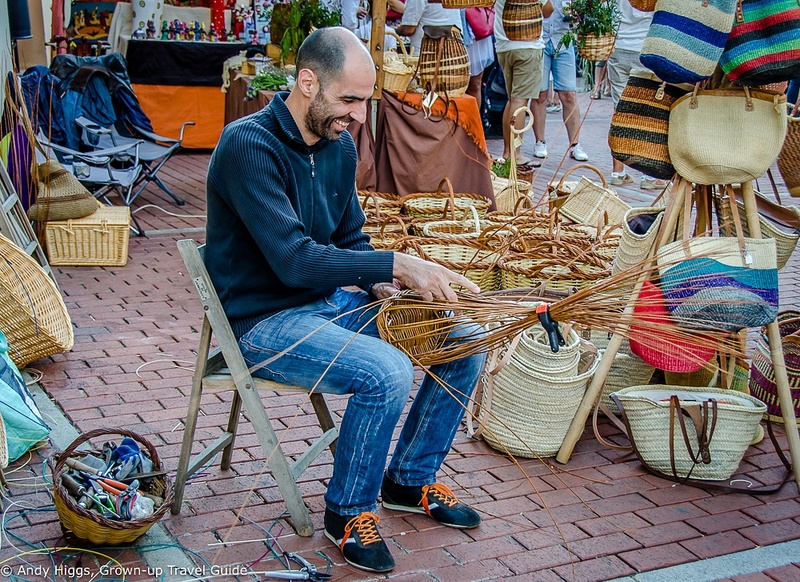 Artisans create and sell crafts and souvenirs and mohitos replace Spanish wine. Everyone seems to be wearing white and their look is topped off with a bandana or a straw hat. What on earth is going on? 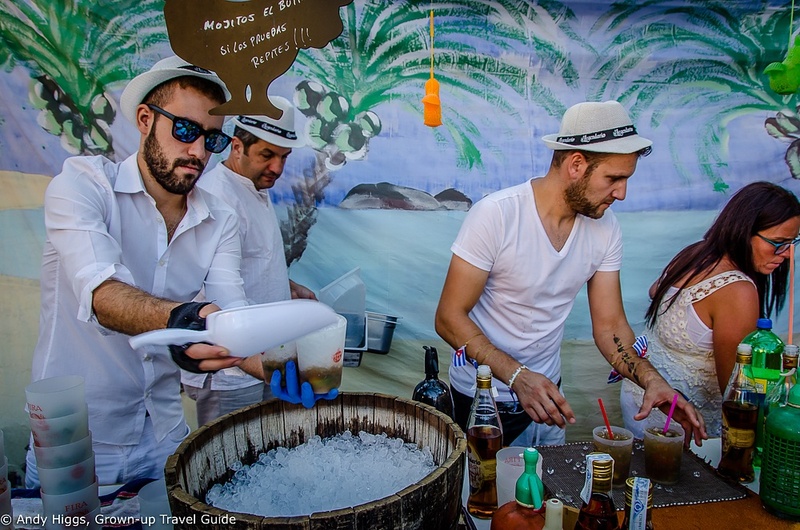 The Indianos Fair relives the golden age of the Spanish colonies in the West Indies and Begur becomes a slice of Havana in the middle of Catalonia. 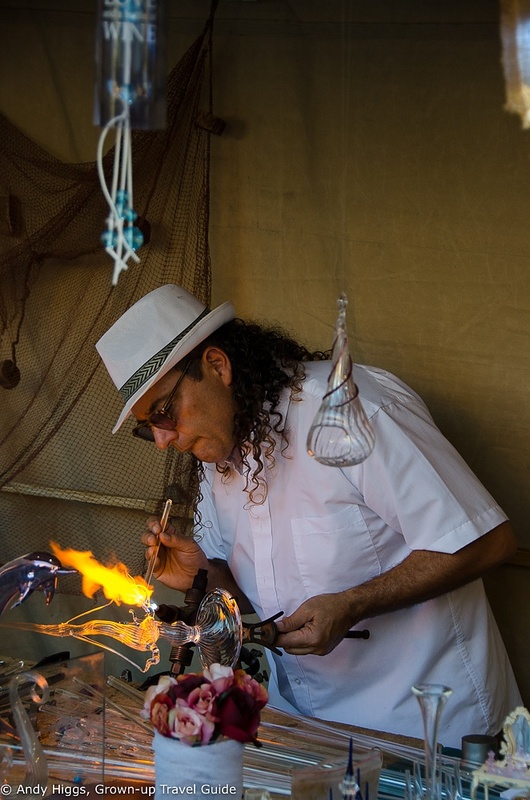 It all stems from the relationship between Cuba and Begur and their shared history. 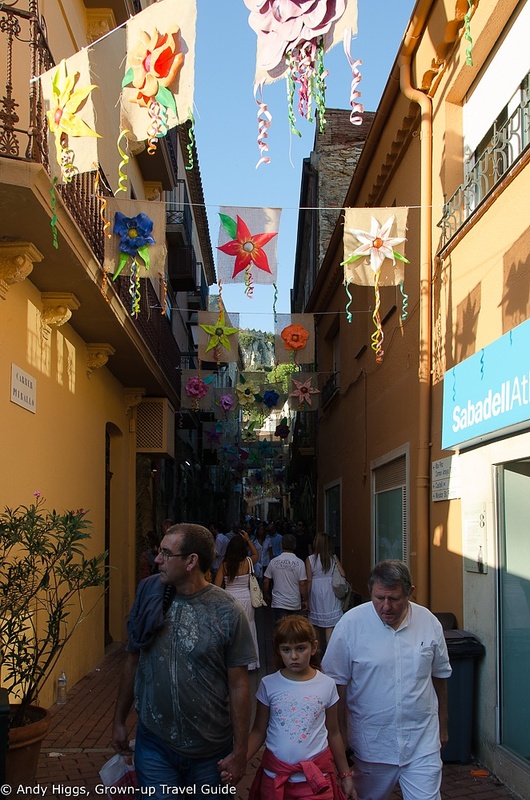 Facing uncertain times in this part of Catalonia in the 19th century, many residents of Begur left to seek their fortune across the Atlantic and especially in Cuba. Some found it, too – often called the Americanos, they became rich and returned to Begur to build huge mansions in the colonial style. They shared their spoils too, helping to build hospitals, town squares and other public works that still stand in Begur today. 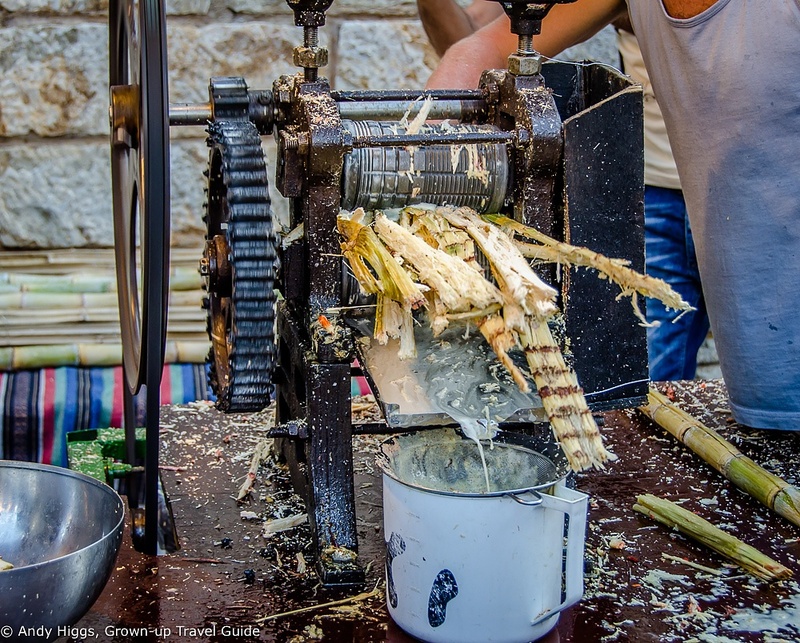 The Cuban influence extended to more than just architecture – it also impacted gastronomy and music in Begur. Hence the salsa and mojitos, amongst other aspects of the Fair. Naturally we had come prepared and were decked out in white, and on arrival we were given a straw hat each to complete the look. I wouldn’t go as far as to say we blended in, but it helped at least. 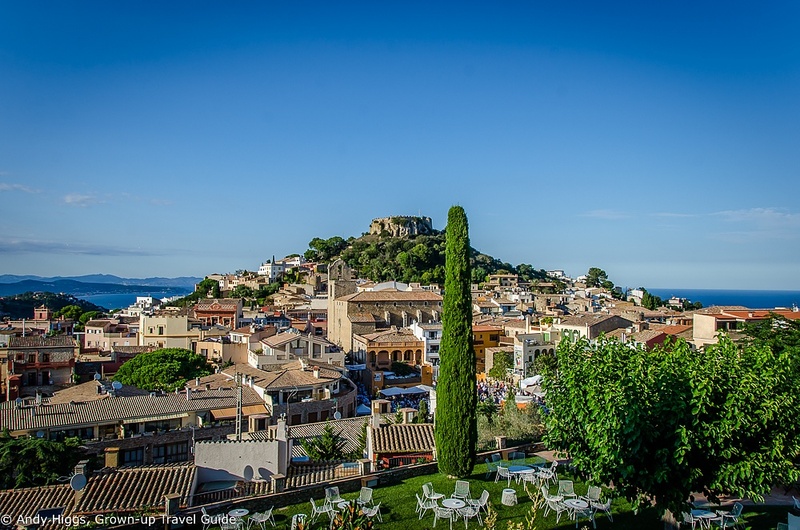 After watching a band serenade the crowd on the edge of town we made our way to the centre of Begur, following the scent of rum and the almost hypnotic music emanating from several large sound systems set up in a number of squares. Lining the route were a wide range of craft stalls as well as refreshment stands. Many of the items on sale are typical products of the colonial era and as for refreshments, strong coffee and even stronger rum featured heavily. The food is authentic, too – if you are feeling hungry just grab a seat at one of the public dining areas and enjoy some typical West Indian fare. 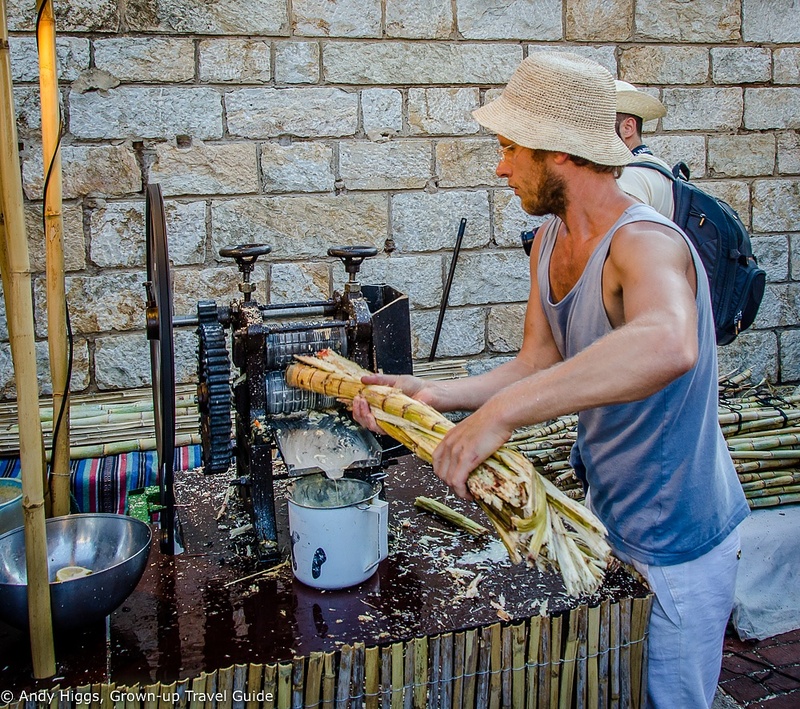 If you want an authentic rum cocktail, you need sugar cane juice. You may be surprised to learn that I passed on the opportunity to sample one as I was still on something of a buzz from lunchtime. See, I can be sensible too, now and then. 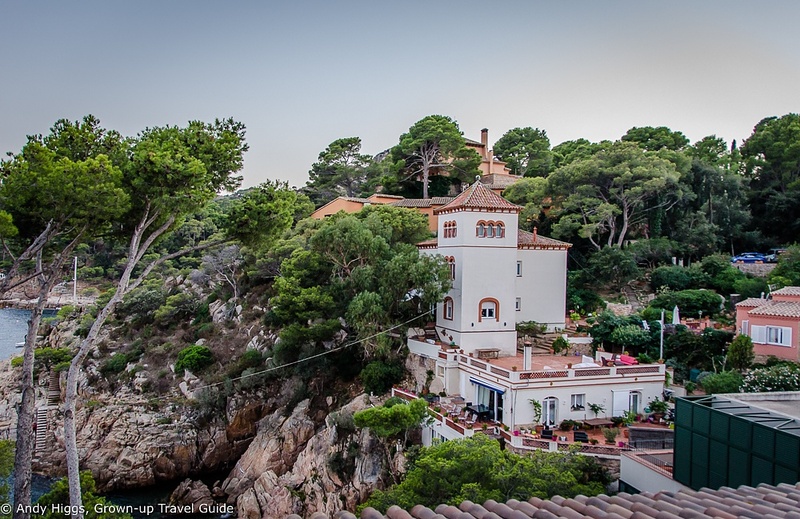 If you want to stay over in Begur, one option is the Aiguaclara, set in a mansion dating from 1866. That would definitely fit in with the theme, but you will need to book ahead – especially during the fair – as there are just ten rooms. You know how people who are really good at something make it look easy? Yup, this guy. 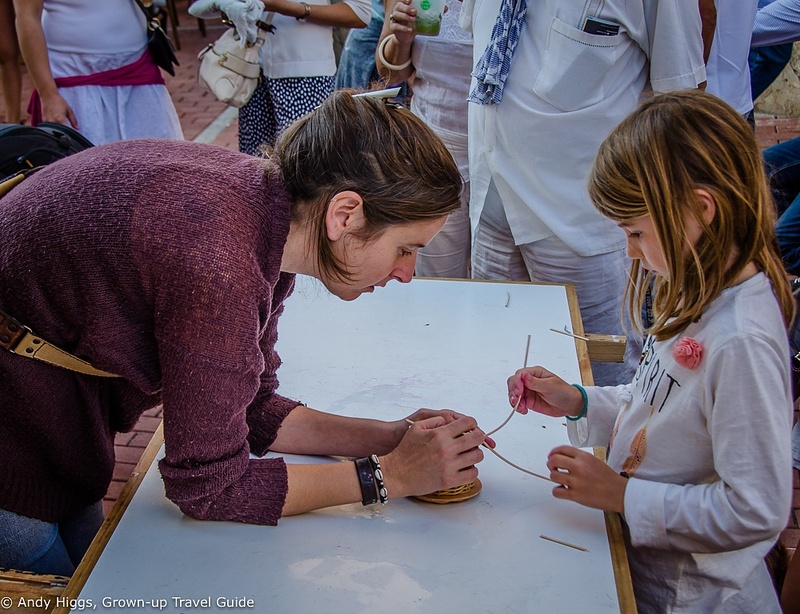 The fair is not just about watching others, though – there are plenty of opportunities to learn a new craft or just have fun trying, and as usual in Catalonia children are well catered for. No, you won’t struggle to find a mojito. As you can see, the Indians Fair is great fun and I cannot recommend it highly enough. The Costa Brava is perfect in early September as for the most part the crowds of tourists have departed (although the fair is of course hugely popular). So why not time your visit right and sprinkle a little Cuba on your Catalonia? For a perfect end to the day, do what we did and book a table at the stunningly located Hotel Aiguablava, a ten minute drive from Begur. More of a resort than a hotel, the Aiguablava dominates the bay of the same name and is surrounded by coves, rocks and pine trees – in other words, this is the classic Costa Brava. 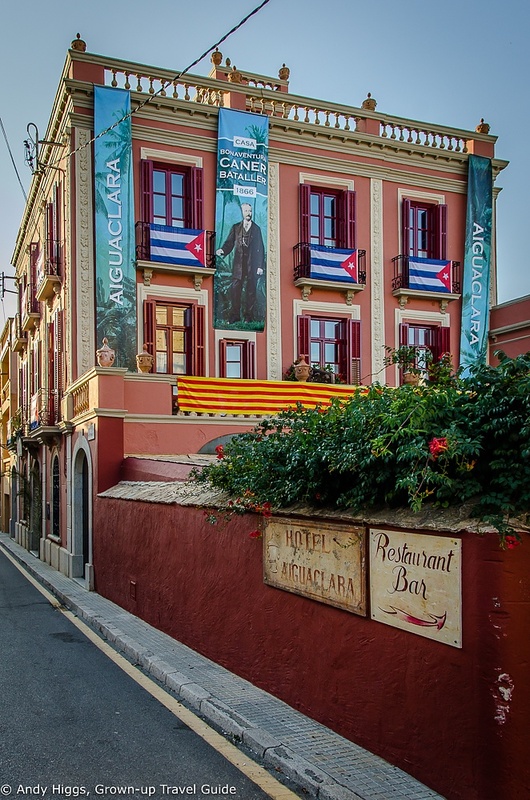 Managed by the same family for four generations, since opening its doors in 1934 the original Clareta Hostal was transformed into the current Hotel Aiguablava some years later. For dinner we were seated on the lovely outdoor terrace and treated to a wonderful menu – starting with an exquisite Cava, the starters were tomato with lobster and chili sauce and an organic egg with fois gras on a banana tatin – the latter is a signature dish of the restaurant. I had a delicious grouper for my main course, served with potatoes, onion and rum. As you will see from the end of the video above, we finished up with passion fruit and chocolate and flambéed crepes – prepared spectacularly at our table.